It’s always our mission to offer patients safe, effective and state-of-the-art treatments when it comes to their oral health. We’re proud to be able to help you smile bigger and brighter with custom dental implants that are perfectly placed and designed with you in mind. Whether you’re missing a tooth or have fractured a tooth, you’ve come to the right place. At Palmetto Smiles of Charleston, we use the latest scans and implant technology to get your smile back to where it should be. During your initial appointment, we’ll discuss your unique needs and provide you with an outline for treatment. We also take scans of the affected area that will show us exactly where the nerves are located, allowing us to perfectly place the anchor for your permanent tooth. Depending on the amount of time your tooth has been missing or fractured, we may even be able to supply you with a temporary tooth. We’re proud to have recently added an Itero intraoral scanner to our practice, which allows us to take precise measurements and create models of your teeth. For superior implant placement, we rely on the Sirona Cone Beam, which offers gentle, natural looking final results for implants that look and function just like your actual teeth. Best of all, our implant process requires no stitches, sutures or cutting. In addition, Dr. Campbell is an Associate Fellow Member of the American Academy of Implant Dentistry. This is an honor not many dentists obtain. How long does the implant process take? Each patient comes to us with a unique set of circumstances, so treatment length greatly depends on many factors, including how long your tooth has been missing as well as quality and quantity of bone. 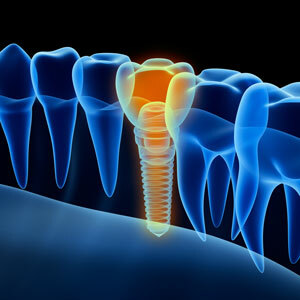 The entire implant process may take up to three months. Will my implant look natural? Yes! Many patients tell us their friends and family can’t even notice a difference between their implant and natural teeth once the permanent implant is placed. Your implant will match other teeth in shape, size and color. We happily offer patients the option to be sedated or awake and numbed during the implant process. There is no charge for nitrous oxide sedation. Oral sedation is also available. The choice is completely up to you. Wondering if implants are right for you? Contact our practice today to schedule your no obligation consultation.